Two lovely things happened this week: my Back-to-the-Future box arrived and I had my first book event for Enchanted Ivy! Remember that scene at the end of Back to the Future where Marty's dad receives a box of books -- books he's written -- in the mail? Okay, maybe you don't. But I always saw it as the highlight of the entire movie. I wanted that box. In a recent interview, I was asked what has surprised me the most about being a published author, and one thing is that publication isn't a single moment. It's not all about that "yes" on the phone or the pub date. There isn't a day when the elephants parade through your living room, hot-air blimps throw confetti over your house, and Ewoks play timpani on Stormtrooper helmets for you. Instead, it's smaller moments, which I think I like better because the smaller moments can sneak up and surprise you, like receiving the Back-to-the-Future box. Not sure why this surprised me, because one thing I've learned time and time again is that life is all about the smaller moments. Anyway, my Back-to-the-Future box (a.k.a. my author copies of Enchanted Ivy and the paperback edition of Ice) arrived this week. My husband and I opened the box together and stacked all the books in giant towers. Then we sat on the floor and admired them for a long time. 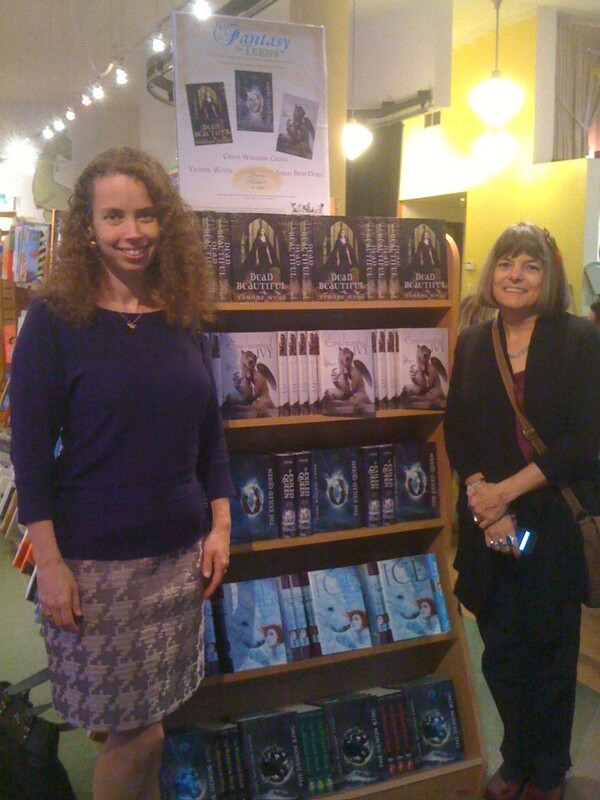 The other cool moment of the week was the "Fantasy for Teens" book event at Books of Wonder in NYC last Thursday. I spoke and read with two awesome authors: Cinda Williams Chima and Yvonne Woon. I also accidentally said I hear voices, but we'll gloss right over that. I LOVE doing events at Books of Wonder. For one thing, it's a fabulous bookstore. For another, they really do events right. Very organized, very enthusiastic, and all-around wonderful. Thank you to Peter and the Books of Wonder staff, and thank you to everyone who came out to the event! You're all awesome! 3 days until Enchanted Ivy! I really hope you'll coome to the UK soon..
Plus, i LOVE the outfit your wore in that picture, very pretty. In My Mailbox: Enchanted Ivy and Ice!